There is one of those pizza stores in our town that sells the take and bake pizzas. You know the one that you order the pizza and then you take it home to bake it. 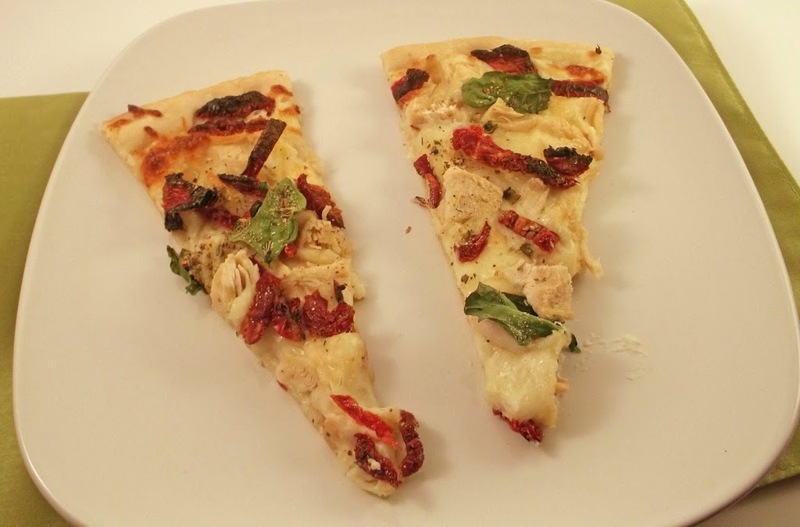 They sell a garlic chicken pizza that has sun dried tomatoes and spinach that we love; it is a nice alternative to the everyday pizza. After making my chicken lasagna I have wanted to try this pizza at home. The sauce that I used for this lasagna got me thinking that it may work for the pizza, with a few little tweaks. I have to admit I was really happy with the outcome of my pizza. My daughter Krista told me that she actually liked my pizza better than the one that we buy at the store. Maybe the only thing that I will change next time is to add a little more garlic to the sauce, other than that it was really tasty. If you like a more mild tasting sauce this sauce is perfect. Oh and also I was going to add basil and oregano in my sauce which I forgot to add so I ended up sprinkling it over the top of the pizza before baking it. This worked out fine, but the next time I will be adding it to my sauce. If you are bored with the everyday pizza, this is a great alternative. 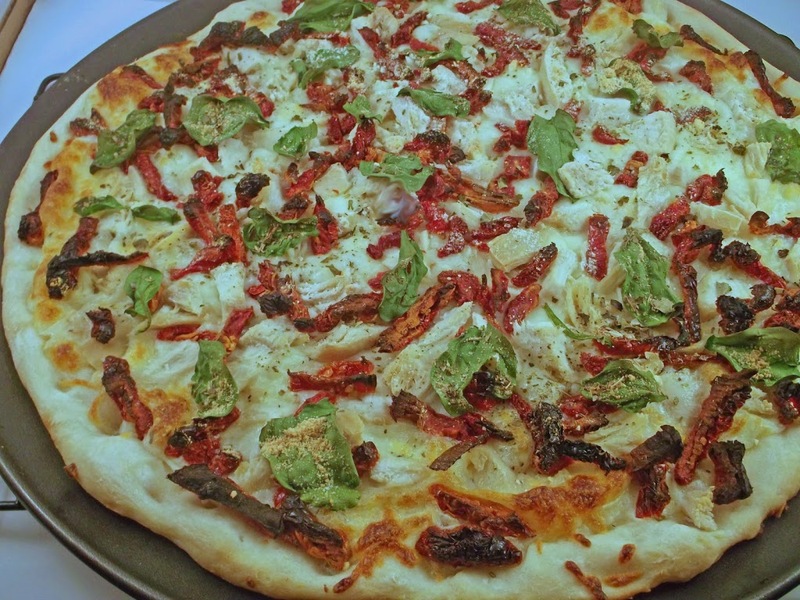 We loved the sun dried tomatoes and the spinach on this pizza, but you can always add your favorites. 1. In a skillet melt butter on medium high add onions and garlic and cook until tender, stirring frequently. Stir in the flour and salt until smooth and bubbly. Add milk and continue to cook stirring constantly until the sauce thickens about 2 to 4 minutes. Blend in the basil, oregano, and Parmesan cheese until sauce is smooth and creamy. 2. Spread garlic sauce over pizza crust. 4. Add the chicken, sun dried tomatoes, and spinach over the mozzarella. Sprinkle with addition Parmesan cheese. 5. Place in a 425 degree F oven and bake for 15 to 18 minutes or until the cheese is melted and the crust has turned golden brown. I could never be bored with pizza I’m afraid. I’ve discovered a great recipe for a base some time ago and it’s too delicious and too easy not to make. I lkie your idea for a topping 🙂 Will use it next time. It looks and sounds tasty! The combo of toppings sounds very tasty for a pizza! And different too from the everyday norm. In a good way. The pumpkin bread under this caught my eye too! I love garlic, so I’d definitely add a bit more! 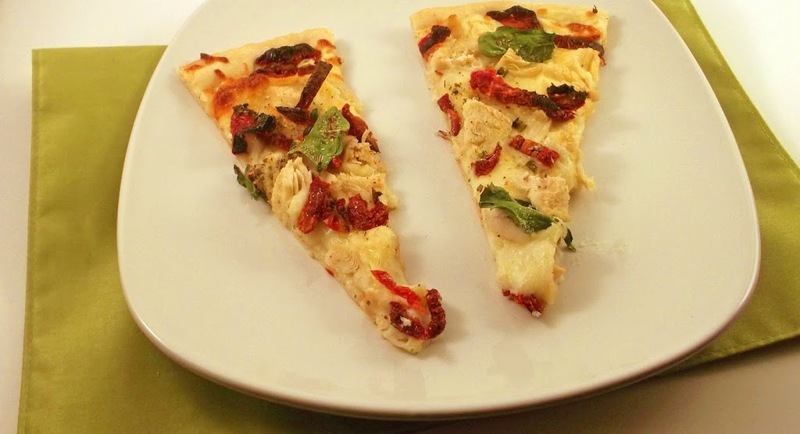 This is a terrific looking pizza – really nice combo of flavors. And since pizza is one of the major food groups, I’m definitely interested in this! Thanks so much.